Buy aquarium tubing in bulk. It is always worth it to get the 25 feet, even when you don't think you will need it. 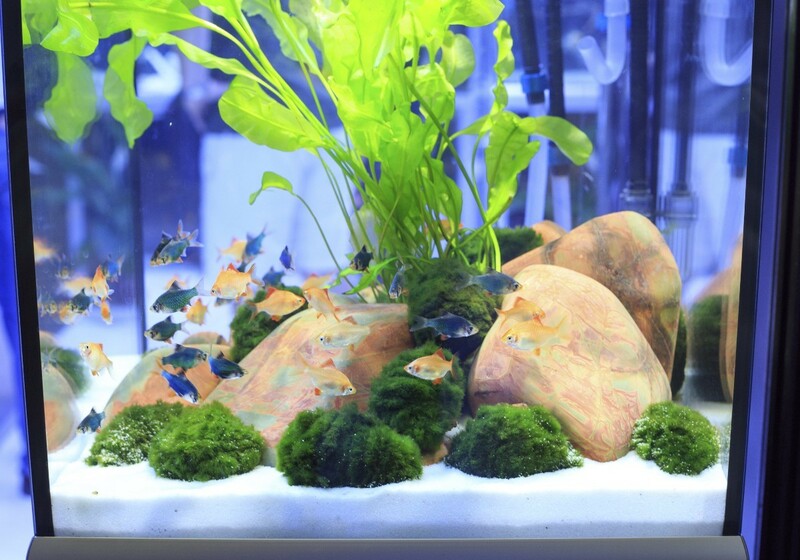 For example, if you have a tank on an aquarium stand and are running a pump, under gravel filter, or aerating decor into the tank, each line will need to be 4-5 feet depending on the height of the aquarium. You are never too good to find a great deal through Wal-Mart. Believe it or not, they actually have great supplies there. The aforementioned aquarium tubing is one example, but other supplies such as Melafix (wide-spectrum antibacterial ointment) or Aquasafe (water decholorinator) will be much less expensive here than at PetCo or PetSmart. Gravel is a great buy here too. Also, I ordered my very first water test kit through the website and had it shipped to store (free shipping). Get a set of measuring cups/spoons instead of expensive water-testing equipment to measure out portions of medications. Find a local fish store and ask for their advice as opposed to advice given at corporate chains. I have nothing against corporate chains, mind you, but employees at respectable local fish stores can give your questions and concerns their complete attention and can follow-up with sound advice. Also at the local fish store is fish food is sometimes sold in bulk. A one-half pound bag of fish food costing $12 is a better buy than half that amount at the same price anywhere. Keep extra fish food in the fridge. Never underestimate the use of good, brand new resealable containers (i.e. Tupperware) just for the aquarium hobby. This includes small containers for storing fish food or pitchers for pouring water into the tank. NEVER use soap in any container that is designed for fish use only. Know what you are looking for. I recently purchased a 5-gallon kit for a single molly (fish) and the cost was approximately $35. The kit came with a hood, light, filter, and some tubing. If bought piecemeal brand new, the tank would have been approximately $10; the hood would have been approximately $10; the light would have been hard to find, but still would have cost around $15; the filter would have been approximately $20. In total, it would have cost $55. None of the cost is including the price of a heater, gravel, decorations, etc. Sometimes at local fish stores, kits are sold including items that would cost more than if the tank and the equipment was sold separately. There is a lot to be said for "shopping around" for the best deal, but when dealing with live animals you never want to get sub-par quality. Fake plants are expensive; real plants are cheap. Fake plants can range in price from anywhere between $3-$30, depending on the size (small, medium, large, x-large) or type (plastic, silk, silk-like). In this scenario, check out PetCo or PetSmart for "betta bulbs". These bulbs were originally designed to grow in smaller tanks, but will grow indefinitely if kept in the proper conditions. A 3-5 pack of bulbs costs around $3, and while there are no guarantees that any of them will grow, the company that manufactures the bulb does make an offer to replace the bulb/refund your money if the bulb does not sprout within 14 or so days. Real plants will eat nitrates and keep fish healthy. They act as a natural filter in the water and keep water conditions perfect. Plants also act as a barrier between more skittish fish and more aggressive fish. Thank you for reading and happy aquarium keeping! Thank you so much for sharing your tips. I have a question however. You sound like you're very knowledgeable about fish. I have a male betta. I know not to put another male betta or any other fish with flowing fins with him. Here's my question tho. Bettas are air breathing and therefore don't need the air pumps that most other fish need. Are there ANY other fish that are compatible with a betta that also don't need the pumps? I have him in a 10 gallon tank now and he's loving it. But I'd sure like to get him a couple of "friends". I tried 3 neon tetras, but they didn't make it overnight without a pump. Thanks for sharing, I have done both real plants and fake but I cannot keep the real plants alive because of the lighting and fish. Apparently the light that comes with the tank is not enough watts to grow plants and you cannot use the fixture and add more wattage you have to buy special (very expensive) light housing. Theses also run up your electric bill pretty high too. Also my fish eat the plants like crazy - even the ones they are not supposed to, so for me the fake ones are worth the extra cost because I do not have to replace them over and over. I would prefer the live plants if anyone has a way around my problems please share! Good info. I was in the industry for 18 yrs., here are some more tips. I always hated aquarium tubing, it'd go hard, didn't stretch well, and had to be replaced often. Check out a quality plumbing supply and get PVC tubing. If you use it and want it to last, it's great. Even when it gets dirty & not quite so hard after years, you can clean and boil it...makes it like new. Ryan Herco has quality stuff, you do have to buy at least 100 ft. but it will last for decades. Honestly, you can use it for many things. I always boil the ends of tubing before putting it on fittings. I get a cup of water and heat it to boiling in the microwave. They also sell any size tubing you could want for anything. They do not sell junk. Corporate chains want to sell you their products, just listen to everyone and analyze what they say, use common sense. The dechloridizers they have at pet stores are expensive, but find out how much of the actual chemical they put in it. Buy a 5 lb. or more bag of the chemical from a chemical company, it's called sodium thiosulfate. It only takes a tsp of the clear crystals to dechlor a lot of water. But here's the thing, when you use this stuff it doesn't really get rid of the chlorine, it changes it into amino acids. This will build up in the water and can cause problems. Use bottled water for water changes and top offs. Get a water system, not Brita. Garbage, a reverse osmosis, is good for you and the pets. Pays for itself in about a yr, depending on how much water is used. It can be used for everything you eat or drink. No matter what you do, buy bottled water or get a system. Don't dechlor the water you use for the fish. It's the kind of thing that you don't notice til you try to add a new fish to an established tank. I use the chemical for getting rid of chlorine I use to clean aquarium equipment. Bleach kills germs, bacteria, parasites, and of course mold & algae. I made my own filter media. The stuff they sell is garbage and you have to throw it out & replace it. Find some really good white felt or something like it. You clean it with a hose and if it's dirty, use a little bleach on it, then dechlor it. This stuff is cheap and lasts years. Just clean it with a good detergent and rinse a lot the first time. Hot water is best. I had ready cut stuff and only cleaned them after a number of weeks. Rinse and dry them til you are ready to clean them. If you want to keep the colors on your fish, buy a better light bulb with a good K temp to it and feed richer food. You feed less and it's better for the fish. I used to make 9 months or more of food for myself and customers. The fish loved it and it was good stuff. You freeze what you make. Think about what fish eat in the wild, it's mostly protein. If you have grazers that like algae and plants, put more stuff like kelp or spirlina algae. Grind the food in a blender and add things like green produce, spinach, kale, whatever you have. Good frozen food is really expensive. Look at how much the few ounces you buy weighs & figure out what you are paying per lb. for mostly water. Kelp adds thickeners and holds the food together when you feed. You can add small chunks, it doesn't disperse as bad either. It all depends on what you are willing to pay for what you need. Growing plants remove more than nitrates, they take out ammonia & nitrates and give off oxygen. I have had aquariums for years, love the hobby. I read a great tip one time (and yes! yours are great too) about a turkey baster for a quick simple clean up when you don`t want to do the gravel siphon task, I use a turkey baster to easily get up the trails of poo my very large Pleco leaves in the gravel. I had so many fancy baby guppies I was selling them on Craigslist, I sold many that way but feel uncomfortable about strangers so I quit, but thankfully Petco took all 200 hundred of them, and I have about another 75 for them, they are not going out as feeders I was promised, as they are going to be beautiful vibrant flowing tailed fish. I bought a 2nd aquarium just because of the situation, but still was having too many babies. Petco is not paying me or giving me a credit, but are solving my problem and I am happy.